The overall purpose of the Art program is to give each child the opportunity to create and express themselves through the use of different media. Our cultural diversity is reflected in each student’s finished artwork. Creating sugar skulls and watching a video about the Mexican holiday Día de los Muertos (Day of the Dead/All Souls Day) is an example of learning about the Mexican Culture through art. Creating African clay masks gives student a glimpse into the culture of this vast continent, from which many of our families are recent immigrants. Crafting Egyptian mummy cases illustrates the elaborate artwork and cultural beliefs of those ancient times. Various religious celebrations are celebrated in the art curriculum. Stained glass windows and nativity scenes are created during the Christmas season. During Christmas 2016, students in our art program created decorations for the Worcester Historical Society to be displayed on Christmas trees at the Salisbury Mansion. 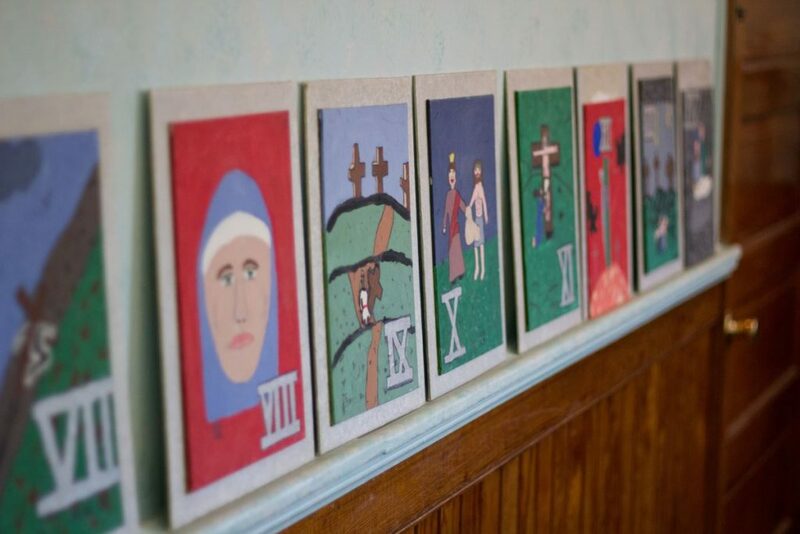 The older students draw the 14 Stations of the Cross to learn about the Lenten season; these artworks are on display during our Holy Thursday Passion Play. Students have the opportunity to use a variety of materials and media including pencil, pen, crayons, chalk, markers, glue, paint, textiles, canvass, scissors, different types of paper and recyclable material. The art curriculum includes concepts of color, line, texture, shape, form, pattern, symmetry, and space through various age-appropriate lessons. Technology is also used to supplement students’ understanding of current art projects. Digital and online sources are used to enhance art lessons and provide context. For example, showing a short video on the life of Vincent van Gogh gives students a greater understanding of the history of art and a closer look into artistic techniques and methods.